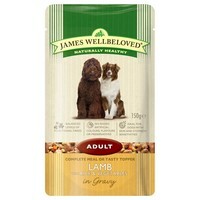 James Wellbeloved Adult Dog Lamb & Rice Pouches are a complete wet food with the bonus of being hypo-allergenic. They are ideal as a tasty topper to James Wellbeloved dry kibble, as long as you remember to reduce the amount of kibble fed by 35g for every pouch used. With selected protein sources and rice as a source of carbohydrates, James Wellbeloved pouches are dietetic food that is excellent for the reduction of ingredient and nutrient intolerances. Vet recommended . My dog has 1 pouch of meat with 1/2 a cup of JW kibble , loves it . We use this as a topper to JW senior kibble and our two Westies love it. They each have a quarter of a sachet so the sachet lasts 2 days - very economical. It was recommended by my vet the best dog food I have ever bought my jack russell loves it. I give this to my Yorkshire Terriers, I warm it in the microwave then mix it with JW kibble. My dogs love this food - its gone in seconds!. Unlike other dog foods this looks AND smells good enough for human consumption let alone dogs and has no harmful additives to cause allergies in my dogs. I find other moist/wet dog foods smell awful and stink the kitchen out but James Wellbeloved smells lovely. Highly recommended and its cheaper to buy it here than in pet shops too. I use these as a topper on my dogs dry kibble for dinner. One pouch split between them is enough and they love it. They have sensitive tummies and this causes no problems. Great product, good value and convenient.